The owner requested Blue Quality Services provide our Building Enclosure Quality Assurance Program during design and construction to verify that the building and all of its systems and assemblies were designed, installed, and tested to meet the owner’s requirements. Prior to construction, Gables Residential requested our consultants perform a detailed review of the enclosure assemblies and mechanical systems for operational performance and constructability. Once the building wall, window, and roofing performance needs were identified, we reviewed the drawings, details, and specifications for potential issues, conformance with project requirements, and constructability concerns. Our team also reviewed the available structural system documents for the residential apartments and 3-story townhomes. During the construction phase, Blue Quality Services field services team visited the site weekly to verify that the installation of the building enclosure systems were meeting project specifications. System observed included below grade waterproofing, air and moisture barrier installation, window and door installation, masonry and cladding installation, gypsum board installation, and all enclosure components related to the retail level Whole Foods and it’s associated underground parking garage. An issues list was maintained throughout the project, detailing the observed issues, the date observed, a description of the resolution, and the issue’s resolution date. Gables McKinney Ave is a luxury, class A+ mixed-use complex comprised of 222 apartment homes and 17, 3-story townhomes. 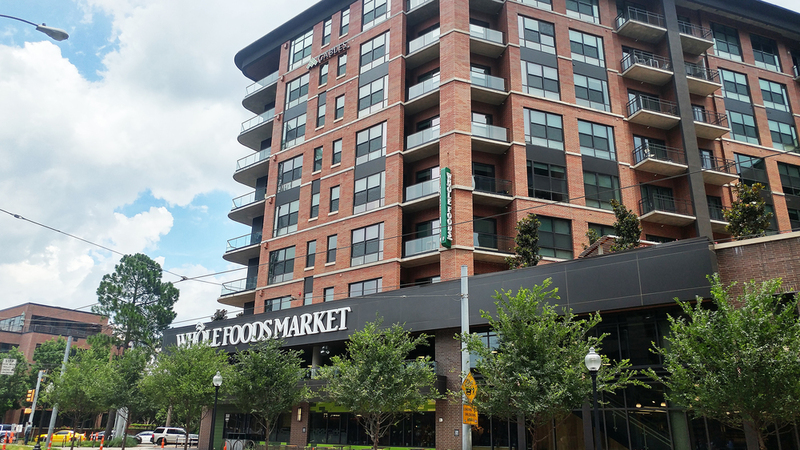 The community is located above a Whole Foods grocery store.